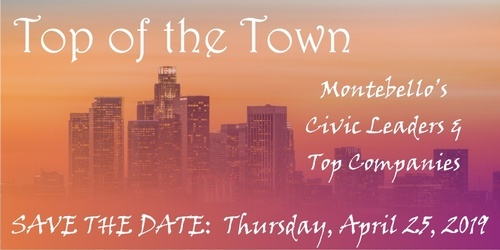 Top of the Town will bring together Montebello's civic and business leaders for an evening soiree at the elegant Quiet Cannon Event & Conference Center. Chamber members are invited to meet new city councilmembers and heads of city departments in an intimate setting. Montebello companies who have ranked as top contributors to the city's sales tax revenues will be honored. Champagne and appetizers will be served. By invitation only. Space is limited. Limit two representatives per company. Sponsorship opportunities available. Business attire recommended.